In the Quran, there is a verse that says “And Allah calls to the Home of the Peace” (Quran10:25). It means that the goal of Islam is peace and all the teachings, morals and values are dedicated to the goal of Islam. Also as in one of the Hadith, a man came to the prophet Muhammad and asked him for an advice about how to manage things in his life, the prophet said "don’t be angry". This means that in any situation a human being should remain positive no matter how many difficulties he/she faces because humans tend to be according to their nature, and nature symbolizes peace. But when they get angry, there nature will be surrounded by negativity which will lead them to troubles and problems. Thus the word peace in Islam is essential because the whole concept of Islam is about peace, and peace symbolizes many things toward which people can be dedicated to. Peace has held a greatest impact on Islam because any work done with a peaceful mind will have positive consequences, unlike a disturbed environment. A simple example would be if a person wants to study for an exam he/she wouldn’t focus if the environment is noisy or if the person itself is feeling angry or has negative thoughts. Therefore peace is the main aspect to have for a successful life. In addition, once the prophet Muhammad saw in al madinah a funeral procession, so the prophet stood up for respect . One of the prophet’s companion said he was Jew, he is not a Muslim, and then the prophet said isn’t he a human? (Bukhari book, 399). The prophet’s words represent what every human being should be: treated equally no matter the religion and gender. His vision is: everyone should be treated equally with equal respect as all of us are creatures of God. Thus as the prophet’s vision of equality, I believe equality is another aspect in order to have peace. For my art project I chose the title justice in Islam because I believe that without justice, a peaceful environment will not be. Justice is defined as equality. As Allah has mentioned in the Quran “O you who have believed, be persistently standing firm in justice, witnesses for Allah , even if it be against yourselves or parents and relatives”( Quran 4:135). In Islam, there is no one favored beyond others because of their wealth or race since God has created us equal, and the only thing that can distinguish between humans is their piety. For many people justice and equality could be 100% same, but I believe there is a slight difference between justice and equality which is justice is to give everyone his right, but equality is to give everyone the same amount. For example, if a doctor gives all his patients the same medicines with the same doses (which means equality), that wouldn’t be right because a person might need another medicine, but if he prescribes for each person the right amount and the right dose as per the person’s diagnosed sickness that would be fare (which means justice). Thus, because of that I chose my title to be justice in Islam in relation to peace in Islam rather than equality in Islam. For my art project, I made equalizer. The reason I chose to make an equalizer is because it symbolizes justice. 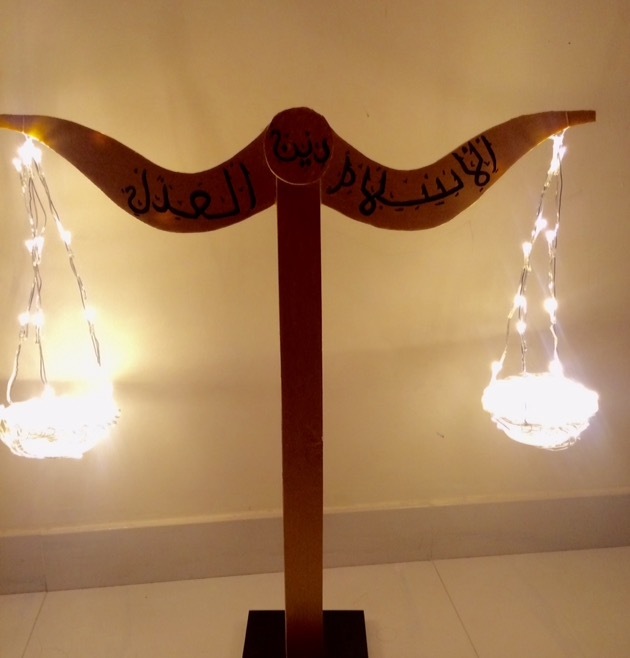 The equalizer consists of: the base which is made of wood; the upper part is made of foam board written on it’ (الاسلام دين العدل) which means Islam is the religion of justice, with two small wires hanging on them a half of a round plastic cup. The base and the stick are attached by two pins. Also, the equalizer I made is surrounded with yellow lights. I chose yellow because the color yellow represents sunshine and happiness. Thus I believe in a country where justice is the main concerned, brightness and positivity will prevail. Since I have watched Julien Breton’s work who is an artist that uses light calligraphy dependent on body language, I wanted to use light also in my art project because as the yellow color, light also represents brightness. However, I couldn’t manage to use light as Julien Breton did, but I managed to add some light to my project. Moreover another thing that has influenced me to choose my topic is the verse from the Quran “يَا أَيُّهَا الَّذِينَ آمَنُوا كُونُوا قَوَّامِينَ لِلَّهِ شُهَدَاءَ بِالْقِسْطِ ۖ وَلَا يَجْرِمَنَّكُمْ شَنَآنُ قَوْمٍ عَلَىٰ أَلَّا تَعْدِلُوا ۚ اعْدِلُوا هُوَ أَقْرَبُ لِلتَّقْوَىٰ ۖ وَاتَّقُوا اللَّهَ ۚ إِنَّ اللَّهَ خَبِيرٌ بِمَا تَعْمَلُونَ" (8). . Which means the unbeliever does not prevent him from enjoying justice because justice is for all humans not just for Muslims or people depending on their wealth or race. The message behind my art work is that justice is for all humans as they are God’s creatures. All the humans have right to be treated equally with respect and by providing them with all of the rights they deserve. Also I believe that all the wars and conflicts which are happening in many countries wouldn’t have gone to a very large extent, if all the people who are living in those countries had their rights equally as others. I believe that one of the roots of those wars has to do with justice because people won’t tolerate the fact that others are fully provided with their rights but not themselves. My name is Ayesha Alqaz, I am a student at the American university in Dubai studying Engineering, second year. I am not very good at art but personally I really adore art especially the message used behind an art project. "Yunus 10:25." IslamAwakened. Web. 21 Nov. 2015. Khan, Maulana. "Islamic Way of Thinking." Center for Peace and Spirituality. Web. 21 Nov. 2015.